Direct access to many of the world’s leading exchanges. Numerous options for configuring your trade preferences. Workspace layouts follow you from machine to machine. Completely customizable user interface, including colors, fonts, window size etc. Easy and quick trade entry, modification and cancellation. Multiple order entry methods including Matrix, Market Depth and Trade Pads. Color-coded time-and-sales window with custom filters. Standard order types – Limit, Stop, Market. Customizable Market View (Level 1 exchange quotes). Customizable “Tactics” for creation of Strategies such as triple contingencies. Automatics scale in and scale out with trailing stops. “Cancel All” button to immediately close open orders. “Flatten” button to close all open positions. Link windows so that a change of symbol in one window changes the others. Add/Remove columns in all grid windows including Level 1 quotes (MarketView). Customize default trading quantities and levels by symbol. Programmable hot keys make it easy to quickly enter and exit trades. Float windows anywhere on your multi-monitor screen. Utilize a “heads-up” display by floating the Trade Pad directly over your charts – no need to shift your focus to enter a trade. Save multiple desktops/layouts and move rapidly between them. Automatically retrieve your desktops/layouts when trading from a different machine – very useful when moving between office, home and laptop(s). The application automatically updates to the latest version upon log-in. Instant access to the Photon Control Center (help) via built in instant-messaging. Free One-On-One training upon request. 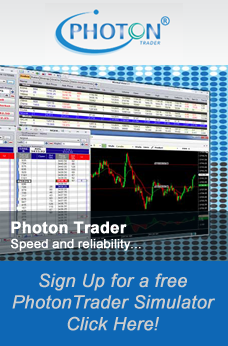 Extensive help files and instructional videos make it easy to get the most out of PhotonTrader Pro.